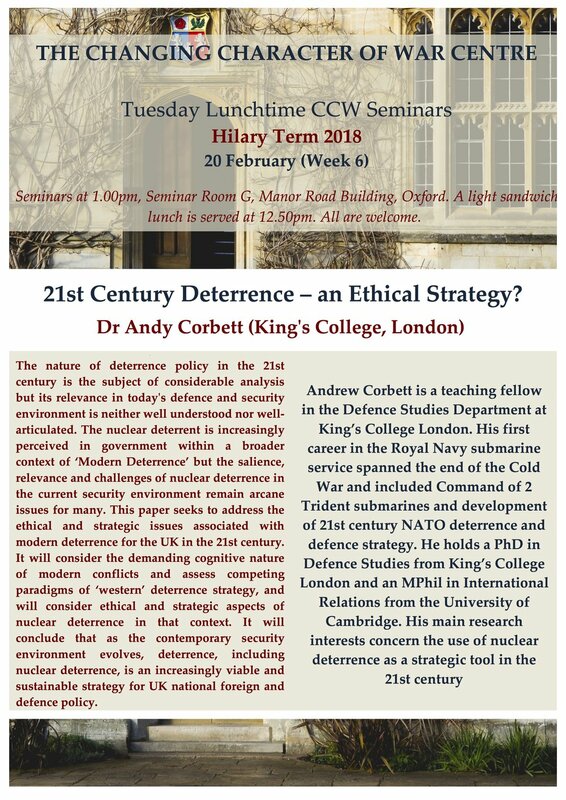 21st century deterrence – an ethical strategy? The nature of deterrence policy in the 21st century is the subject of considerable analysis but its relevance in today's defence and security environment is neither well understood nor well-articulated. The nuclear deterrent is increasingly perceived in government within a broader context of ‘Modern Deterrence’ but the salience, relevance and challenges of nuclear deterrence in the current security environment remain arcane issues for many. This paper seeks to address the ethical and strategic issues associated with modern deterrence for the UK in the 21st century. It will consider the demanding cognitive nature of modern conflicts and assess competing paradigms of ‘western’ deterrence strategy, and will consider ethical and strategic aspects of nuclear deterrence in that context. It will conclude that as the contemporary security environment evolves, deterrence, including nuclear deterrence, is an increasingly viable and sustainable strategy for UK national foreign and defence policy.